Expected 5G spectrum utilization will mean major engineering and design challenges in terms of spectrum characteristics: very high frequencies and very large channels, with high expectations for performance. Vendors, operators and government initiatives around the world are testing and trialing 5G technologies to understand and cope with the challenges of the next-generation of technology – and many of the lessons learned and fundamental technologies from LTE will ultimately enable 5G. RCR Wireless looks at some of the 5G trials and testbeds, R&D work and how the test industry is supporting the evolution to 5G. The telecommunications industry is barreling toward “5G” at a breakneck pace, with new pre-standard tests and trials announced nearly every week. Network equipment manufacturers, academic researchers, carriers and other technology vendors have spent the last few years preparing for the next generation of cellular systems, with the aim of ramping up research and development and early testing and trials to explore various aspects of “5G” technology. In the lead-up to standardization, companies across the industry, university researchers and government programs have all been involved in an industry-wide effort to determine what will make up 5G systems, and how those systems will ultimately function optimally in order to reach the much-hyped promise of 5G. This report looks at how the transition from LTE to 5G is shaping up; the major technology approaches that will migrate and shift from 4G to 5G; and how test equipment and approaches have to change in order to support 5G, from the chipset and device to the air interface, network architectures and network software. 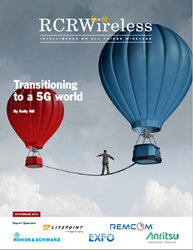 RCR Wireless News spoke with experts across the wireless network ecosystem for their views on the evolution from LTE to 5G, including Frost & Sullivan, Nokia, Samsung, Vodafone, LitePoint, EXFO, Rohde & Schwarz, TEOCO, Cambium Networks, Viavi Solutions and Qualcomm, among others. The report, entitled “Transitioning to a 5G World: How testing is evolving to meet operators’ needs” looks at how the transition from LTE to 5G is shaping up; the major technology approaches that will migrate and shift from 4G to 5G; and how test equipment and approaches have to change in order to support 5G, from the chipset and device to the air interface, network architectures and network software.